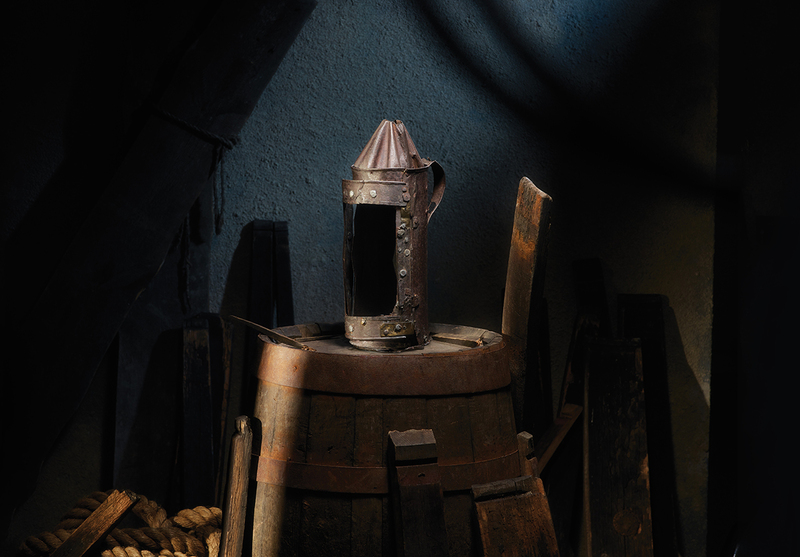 Guy Fawkes is said to have been carrying this iron lantern when he was arrested in the cellars underneath the Houses of Parliament on the night of 4–5 November 1605. Fawkes and his conspirators planned to ignite barrels of gunpowder concealed under firewood in the cellar during the state opening of Parliament when the King, Commons and Lords would all have been present in the Lords’ Chamber – the aim of the ‘Gunpowder Plot’ being to blow up the chamber and kill the Protestant King James I. Thanks to an anonymous warning, the cellars were searched, Fawkes was discovered and the plot failed. The lantern was given to the University of Oxford by Robert Heywood who had been a Proctor – an official responsible for ensuring the rules of the University are observed. His brother, Peter Heywood, had accompanied Sir Thomas Knyvett, Keeper of Whitehall Palace, in his fateful search of the cellars and is credited with taking the lantern from Guy Fawkes during the initial struggle and preventing him from detonating the gunpowder. The lantern seems to have been passed to Robert sometime after an assassination attempt in 1640 left Peter mortally wounded. Robert then passed the lantern to the University in 1641. For many years it was on display in the Bodleian Library’s Picture Gallery but was transferred to the Ashmolean in 1887 as part of a reorganisation of the University’s collections.